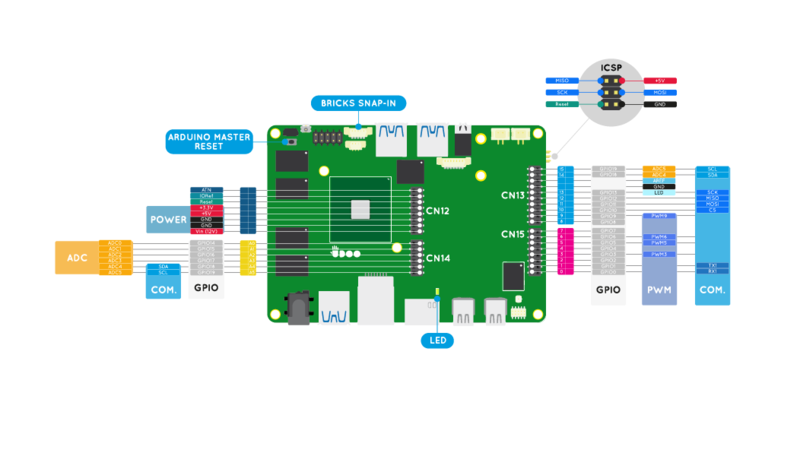 The GPIO (General-Purpose Input/Output) peripheral provides dedicated general-purpose pins that can be configured as either inputs or outputs. When configured as an output, it is possible to write to an internal register to control the state driven on the output pin. When configured as an input, it is possible to detect the state of the input by reading the state of an internal register. In addition, the GPIO peripheral can produce CORE interrupts. UDOO X86 features a total of 36 GPIOs available on the external Pinout connectors. 16 GPIOs are available in the external Pinout columns manageable from the main Intel® Braswell processor of the UDOO X86. These Pins are 1.8V only compliant. 20 GPIOs are available in the internal Arduino Pinout columns manageable from the Intel® Curie™ processor of the Arduino 101 embedded. These Pins are 3.3V compliant and 5V tollerant. Select the tab accordingly to which Processing Unit you want use to manage the related GPIOs. In the following image you can see in grey labels the 20 GPIOs manageable from the main Intel® Curie™(Arduino 101-compatible embedded). Refer to the Arduino 101 (Intel Curie) section to manage the Arduino GPIOs. You will be able to use the internal row pinout exactly like you do with an Arduino 101. In this section you can see how to use the 16 GPIOs manageable from the main Intel® Braswell processor of the UDOO X86. The Linux driver used to manage the UDOO X86 Braswell GPIOs is Cherryview/Braswell pinctrl driver. Since the Linux Kernel version 4.15 the driver has changed the number associated to each GPIOs managable by the external pinout of the UDOO X86. Linux Kernel version 4.15 is the default one in Ubuntu 18.04 LTS distro. Chose the TAB accordingly with the Linux Kernel version are you using. In the following image you can see in grey labels the 16 GPIOs manageable from the main Intel® Braswell. Visit the Pinout Braswell section to see how to enable/disable the GPIO function for these pins from the UEFI BIOS Setup of the UDOO X86. The GPIO function is enabled by default in the UEFI BIOS Setup configuration of the UDOO X86. Warning! Warning: UDOO X86 Pins controlled by the main Braswell processor are 1.8V only compliant. Providing higher voltages, like 3.3V or 5V, could irreversibly damage the board. In order to properly work with an input voltage different from 1.8V use a bidirectional level shifter. Take a look at this exhaustive guide How to use 1.8V serial on UDOO X86 with 3.3V-5V devices by Geduino Foundation to learn how to proper use a level shifter to work with a different voltage from 1.8V in the Braswell pinout. In the following tables you can find GPIO numbers assigned by the driver to each Pin that can act as GPIO. 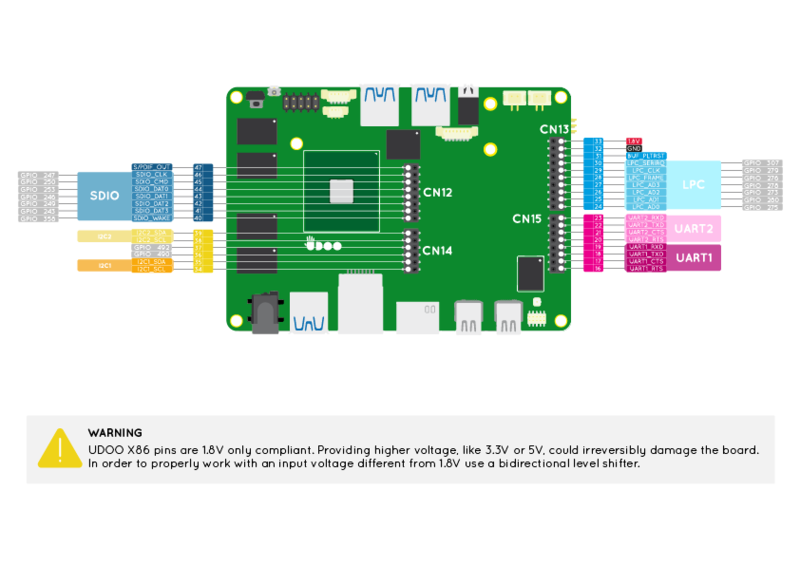 In the UDOO forum you can check the correct procedure to find the correct GPIO number assigned to each Pin explained in this post by fajar.adianto. For those users are still using a Linux Kernel version previous the 4.15 we are still maintaining here the old tables and images with the GPIOs numbers not updated. In the following tables you can find GPIO numbers assigned by the driver to each Pin that can act as GPIO. Here you can find the Driver Documentation in the kernel that explain the use of the sysfs inferface. In /sys/class/gpio folder there are two files that allow you to export pins for access and unexport pins to remove access. Once GPIO pin 307 is exported the following files (or links to files) are created in a new directory, gpio307. A GPIO can be set in input or output configuration. In input means you can read the value of the voltage connected to the pins. In output means you can forces a pin to take a specific voltage. In order to set the value, the GPIO must be in the out direction. If the direction is set to out and you try to read the value, is not guaranteed that the value is coherent with the voltage found on the external pinout.